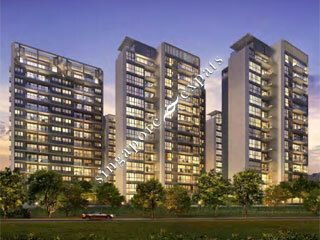 KOVAN REGENCY is located at 2 - 44 KOVAN RISE in district 19 (Hougang, Sengkang) of Singapore. KOVAN REGENCY is a 99-year Leasehold Condo development consisting of 393 units. KOVAN REGENCY is completed / TOP in 2016 (estimated), developed by HOI HUP KOVAN DEVELOPMENT PTE LTD.
Educational institutions like DPS INTERNATIONAL SCHOOL, HILLSIDE WORLD ACADEMY, LYCEE FRANCAIS DE SINGAPOUR, XINGHUA PRIMARY SCHOOL, HOLY INNOCENTS' PRIMARY SCHOOL and XINMIN PRIMARY SCHOOL are near to KOVAN REGENCY. KOVAN REGENCY is accessible via nearby KOVAN, HOUGANG and SERANGOON MRT Stations. Environment is nice and relaxing. Neighbors are well behaved in general. Managing Agent is biased to Developer which is crappy. They have forgotten who are their paymasters. Super convenient location with only 3 mins walk to the MRT station. It is great condo. Just 3 minutes walk to Kpovan MRT. Many eateries nearby as well.